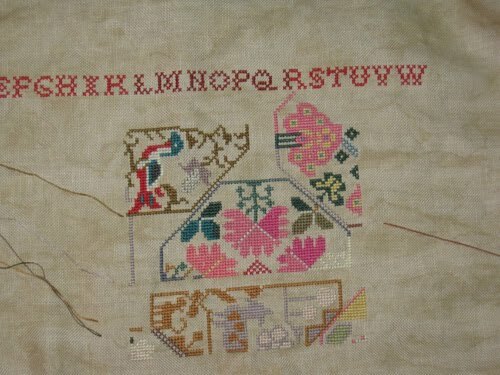 I have been stitching on a downloadable chart from Needleprint. I bought this design last year and started it. I had finished the alphabet across the top and then life and other things got in the way. Last Saturday I bought it out and in the week I finished a page. 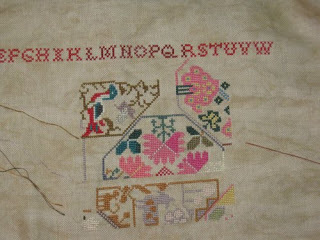 It is not page 1 I finished but page 2 as it was easier to count from the alphabet. I am going onto page 1 next. I got sick of stitching on that so decided to stitch on another UFO called Justice & Peace. It has been charted by Dyan Allaire of Kustom Kraft. I started this one in the early 2000's and have only put in around 500 or 600 stitches so far.